Get unlimited access to the full spreadsheets used to make the charts in this and other posts, and support the ongoing work of this site by becoming a member of Seattle Bubble. It’s been a few months since we took a look at the in-county breakdown data from the NWMLS to see how the sales mix shifted around the county. I like to keep an eye on this not only to see how individual neighborhoods are doing but also to see how the sales mix shift affects the overall county-wide median price. As of March, prices are up from a year ago in the low-end regions, flat in the mid-range regions, and down in the high-end regions. Meanwhile, the share of sales is tilting toward the low-end regions. First let’s look at the percentage of each month’s closed sales that took place in each of the three regions. The last few years have each followed a similar pattern: while sales in the mid-range regions maintain a fairly steady share of sales in the county each month, sales in the cheaper parts of the county (South King) surge in the winter and dip in the summer, with sales in the most expensive parts (Eastside) doing the opposite. Except for a big spike in Seattle in February, so far we’re seeing the same pattern this year. The raw number of sales in all three tiers increased between February and March. Month-over-month sales were up 35 percent in the low tier, up six percent in the middle tier, and up 42 percent in the high tier. Meanwhile, year-over-year sales were down in all three tiers. Compared to a year ago, sales decreased five percent in the low tier, fell seven percent in the middle tier, and dropped four percent in the high tier. As of March 2019, 37.9 percent of sales were in the low end regions (basically flat from 37.8 percent a year ago), 32.0 percent in the mid range (down slightly from 32.6 percent a year ago), and 30.1 percent in the high end (up from 29.6 percent a year ago). 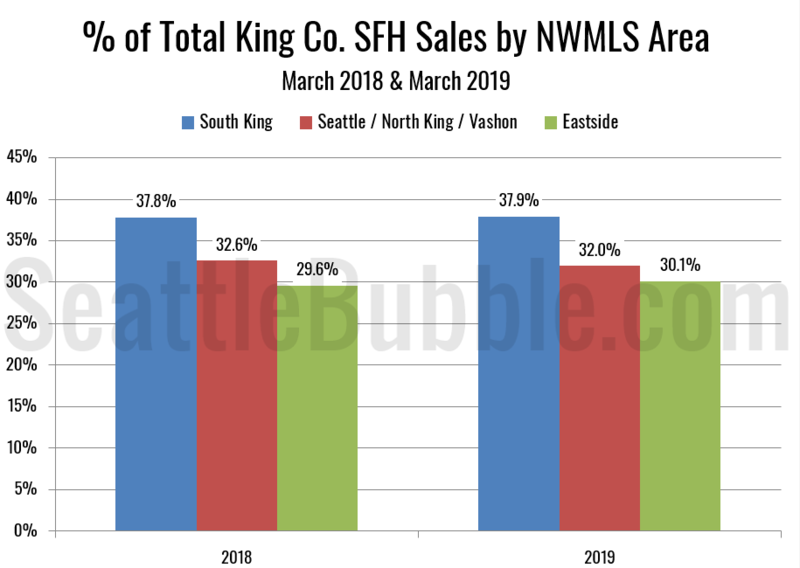 During the housing bubble that burst in 2008, South King consistently had the largest share of sales. We’ve seen the same thing over the last few years as prices have once again grown to astronomical levels. 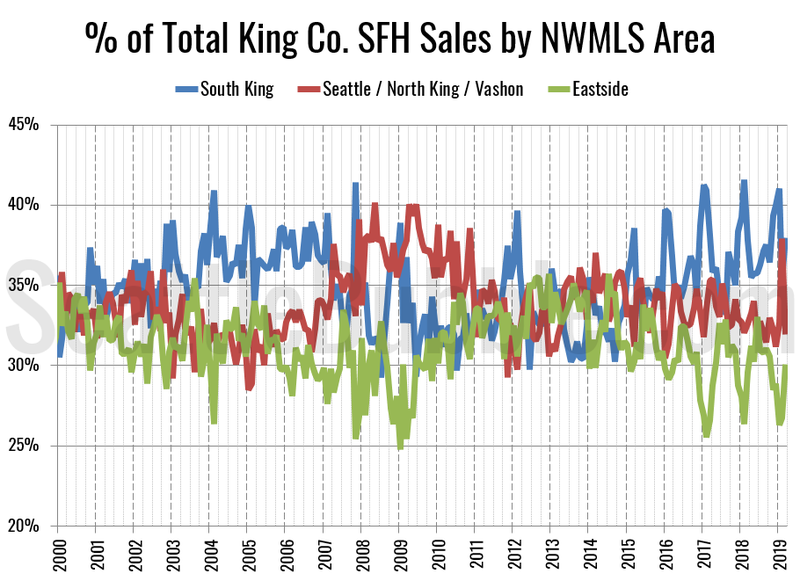 In the lead-up to the big 2008 bust, sales in South King fell as sales in Seattle gained ground. February’s spike in Seattle’s sales share could be a portent of a similar pattern, or it could just be a blip. We’ll see over the next few months. Finally, let’s have a look at each region’s (approximate) median price (actually the median of the medians for each area within the region). All three tiers saw month-over-month gains in their respective median-median price, but only the low tier is currently at an all-time record high. Month-over-month, the median price in the low tier rose three percent, the middle tier increased eight percent, and the high tier gained nine percent. 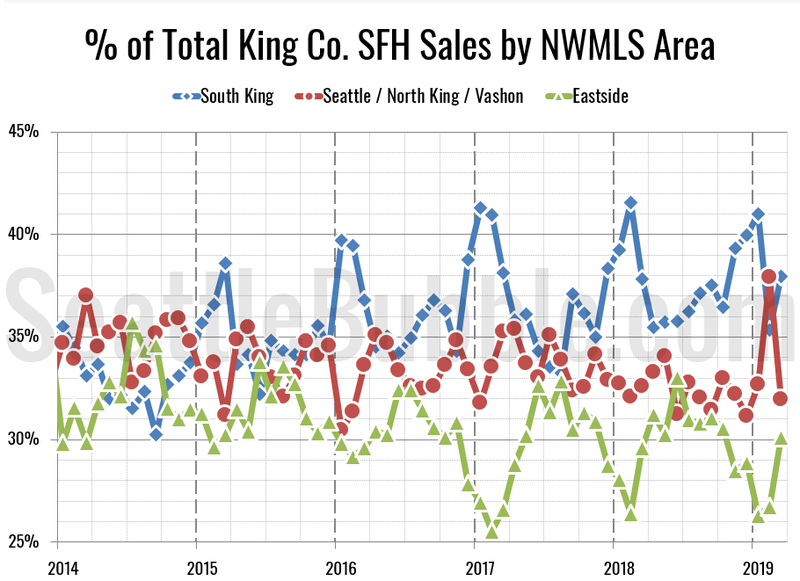 Eighteen of the twenty-nine NWMLS regions in King County with single-family home sales in March had a higher median price than a year ago, while 23 had a month-over-month increase in the median price. Here’s how the median prices changed year-over-year. Low tier: up 5.2 percent, middle tier: up 0.1 percent, high tier: down 4.7 percent. RE: uwp @ 249 – All of your comments are either bullish, or mocking people who aren’t bullish. Don’t be ashamed to be a Bull, embrace it!! I prefer to be thought of as a realist. It’s not as much fun as being bullish, but I take what the numbers give me. Some people can’t accept that current inventory is lower than most of the last 20 years. >>Some people can’t accept that current inventory is lower than most of the last 20 years. Some people can’t take that less than half of what is for sale will actually sell. Months of supply (Supply divided by Sales) is also under long term averages, but whatever dude. Keep it up. Closed sales of SFHs has hit the lowest level since housing crash years 09-12. Had the FED not forced mortgage rates lower by a full 1%, number of closed sales would have crashed by now. This is a very unhealthy and risky market. There is little upside but significant downside. There is little upside but significant downside. Closed sales of SFHs has hit the lowest level since housing crash years 09-12. 1.) Are you saying the current situation is similar to 09-12? Was it a bad time to buy a home then? A scary time? Yes. But a bad time? I would posit that periods of high inventory and low sales are actually a great time to buy a home. 2.) March closed sales were hit by February’s multiple snow storms. I would guess we’ll see a bit of a bump higher for April sales. Bears make money. Bulls make money. Pigs get slaughtered. You’re either on board with the buyers strike, or you’re part of the REIC and your account is fake! I think justme feels a duty to try and temper the influence of the REIC, which is respectable. I see his/her posts in the Seattle Times too, under the name “just bubble”. Obviously comments could possibly help an individual possibly make a more informed opinion. Do blog/comment sections actually have an appreciable influence on the market at large? I’m not trying to be snarky, I’m sincerely interested to know if people think this works. Vote for Seattle Bubble on ranked blogs dot com. I just moved it to #8. I’d put a link but I’m boarding a plane back to Seattle. Followed a link from Facebook for a friend’s blog and saw it there. Compass is #1. Let’s get Tim up there! In a buyers market 3 out of 10 sell. You need to be in the top 3 as a seller. I’ve worked that market. I think I’ve worked in all types. That’s just arbitrary REIC nonsense. 3 out of 10? That is just another REIC made-to-spec definition created so skewed that there rarely is a buyers market. Buyers, if agents tell you this kind of nonsense, let them eat cake. I’m confused. I worked it every day. I know what it looks like. Are you saying I’m lying? Have you ever experienced a strong buyer’s market? Plane is taking off…have to turn phone off. 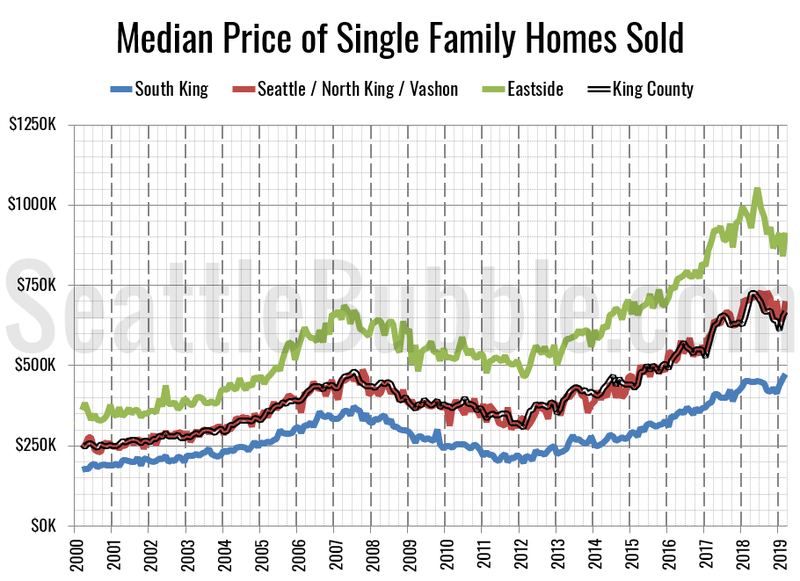 One of the investors that I listen to told me that condos may be near a top, but houses in king and Snohomish County will remain low supply for the next 4 years at least and prices will go up. He said the talk about housing prices going down is a big fat lie. This guy is no slouch when it comes to real estate in the area. Pierce County will probably do well too, but he knows I don’t buy in that county. My investor friend said new houses just aren’t being built and he doesn’t foresee less employment in the area in the next 4 years. He seems to be right all the time because he works with real estate investors all day everyday and knows what’s up. Also, what fraction of people who think they are looking will not actually buy? What’s your point between theses two? The current situation is not 09-12. That was post crash. Yes, it was a great time to buy a home in 09-12. However, from 2017 to 2018 and then 2019, the number of closed sales dropped in half, and then another half YoY. There you also had high inventory and low sales. Many homes ended in foreclosures and short sales, and bankruptcies went way up. If you are an ‘investor’ in the current housing market, you have to know that downside is real. Your crookedness appears to have no limit. Pendings are NOT included in active inventory. You KNEW that already. Look, I understand that intentionally sowing confusion and being illogical is at the blackened heart of your propaganda campaign. You are not actually stupid, just evil, and you don’t mind saying stupid things if it furthers your evil. So that’s what makes you an evil crook. I sure hope nobody believes anything this guy says. Don’t be confused, Ardell. I’m here to help, within reason ;-). If only 3 out of 10 sell, you as a seller have to be in the top 3 by value/price. Likewise, if 5 out of 10 sells, as a seller you’d better be in the top5 best value offered. The problem is that the number 3 just was pulled out of a hat, or worse, was based on “feelings”. It is an asymmetrical criterion, and for a reason: REIC likes to always define the market as being a sellers market, even when it is not. So they make a skewed and asymmetrical definition. Does that make them liars? Dear potential buyer, you be the judge. I would say the point is that 3 out of 10 is quite different from 5 out of 10, or more generally that a 0.3 ratio is quite different from a 0.5 ratio (“half”). Hey buyers, if a realtperson tells you that current conditions is not a buyer’s market, I suggest you tell them you are on strike until the real buyer’s market gets here. It’s a fun joke, but never forget that you buy a house based on price, not based on what “kind of market” some realtperson tells you there is. There’s a whole lot of balanced market between sellers market and buyer’s market. I’ll stick with my 3 of 10 because I don’t think you’ve seen a buyer’s market. it will do until the real buyer’s market arrives. RE: Justme @ 268 – I made no reference to pendings. I was directly quoting your language and concept that less than half of for sale properties would sell. If they’re not going to sell, they’re just not realistically inventory. Interesting that you recognize your own words as evil, stupid, and misrepresentation, but then, you know you best. RE: Justme @ 268 – Please explain again how natural population growth doesn’t translate to additional households. I believe that your theory was that the census counts surplus of births over deaths, and that babies don’t buy houses; while the census doesn’t count people reaching the age of forming new households, and therefore they don’t exist. Did he specifically define houses as single family stand alone units, or apply houses in the more generic term of including town houses with single family houses? I am under the impression that a majority of the new construction of residences are for multi family units, and not single family units on their own lots. Anyone know where one can find information to determine the percentages of the types of units being constructed for King and Snohomish County? As an aside, I have notice in Lynnwood area that single family houses on very small lots are being constructed right next to the freeway. And I really mean right next to the freeway = bedroom windows overlooking 1-5. A sign of the times that single family lots are getting difficult to obtain, or are these houses discounted in price because of their location? He specifically said single family residence. Good question ess. I know a previous commenter, corndogs, would talk about housing starts. I don’t know where to find that information, but I bet deerhawk does. It’s probably important information in forecasting the housing market. I do know you can go figure out planned buildings in Seattle, but I don’t know about sfr’s. As housing investors – lets hope your source is correct!! Seattle produces a “Citywide Permit Report” that displays production of residential units of all types from 1996 to today. There is also an interactive quarterly “Housing Growth Report” in the arcgis app that DPD publishes that can be viewed at a neighborhood/ housing type level.